Bad rankings on Pearson’s Index. Poor results in PISA 2012. Compared to the other nations of the world, the United States is not looking strong. This has started a wave of introspection. International rankings can compare test scores and graduation rates, but they cannot grasp the complexity of raising a human. They don’t measure creativity. They can’t rank critical thinking. They are unable to predict one’s capacity for future learning. Not everything is wrong in American schools just because Pearson or OECD says so. If the rankings make us look within and try to improve, wonderful. In all ways, we should always be trying to get better. If not, we are getting worse. No one should be hanging their heads over this. Just take it as a reminder to grow. There is a lot of good in US schools. School is where your friends are. It’s home to recess, PE class, pep rallies, sports, theater, glee club and many other things you have to come to school to do. Learning can be tough, but you are still a kid and can act like it there. You could live in a country where 12 hours of study a day are standard. School is supposed to be the hardest thing you do in your life. It’s there to toughen you up and teach you how to recover from failure. Your future will be forged by how well you memorize information and repeat it for tests. Your home could have one of the highest suicide rates in the world. School in America is a zone for free expression. Write and speak about what you want. Have bold and original ideas. Find society’s buttons and push them. Debate with passion. Build things and when they explode, rebuild them. School is the place for that. Does the United States make too big of a deal out of school sports? Sometimes, but consider the benefits. No one struts around in a letterman jacket because of art history. The whole school body doesn’t get together and yell about organic chemistry. They do it for sports. It brings them together. Be true to your school like the Beach Boys said. School is likely the first place you ever stood up for colors, a crest and a mascot. You protect your fellow students because you share a home. You want to outperform your rival. It makes you stronger. One day, you will be working for Ford trying to outdo Chevy or at Apple attempting to one-up Microsoft. That fire compelling you to accomplish that? You learned it at school. Many countries have no school sports. Towns or private groups sponsor sports teams. Their schools lack that central athletic link. What could their pep rallies possibly be about? Some nations have summer breaks that are four to six weeks long. The United States enjoys three months. Yes, studies show that summer learning loss is a real thing, but what about the things we learn during summer break? Those three months are the best ones of the year. Students learn so many non-academic skills, like exploring, roughing it and inventing games. The mind needs free time. The best ideas happen when the brain is not under stress. Every year in school brings more and more anxiety, with increasing pressure to excel and qualify for college. Students need time off. School should not be miserable. Not that students must stop learning. Rather, they should change how they are doing it for three months. Get a job. Take an internship. Volunteer. Build something. Keep a journal. Take a trip. Climb a tree with a good book. Summer is the goal students work for and their reward for finishing another year. Don’t take it away. Were you paid for an A when you were younger? Were you rewarded for a great report card? Grades, test scores and pop quizzes are the scores in the education game. Some international education systems pride themselves in not giving grades and testing very little. Passing a test and learning something are not always the same thing, but grades let students know where they stand. They are motivation. They keep students on track every day. Taking away the testing and grading structure from school removes the cause and effect. Students who study and work hard receive good marks. When they leave school for the workplace, they will be evaluated and quantified as well. Quarterly reports, evaluations and reviews will be their new measuring stick. We are a creative and persistent nation. We have recovered from adversity before. Yes, other nations are doing a fantastic job of educating their children. Perhaps we have become complacent. We expect to be the best and think it should always be that way, but you cannot maintain that status with constant work. Back in the 1950s when the Soviet Union launched Sputnik, the United States became concerned that they had fallen behind. Our rival put the first satellite in space and we needed to counter. 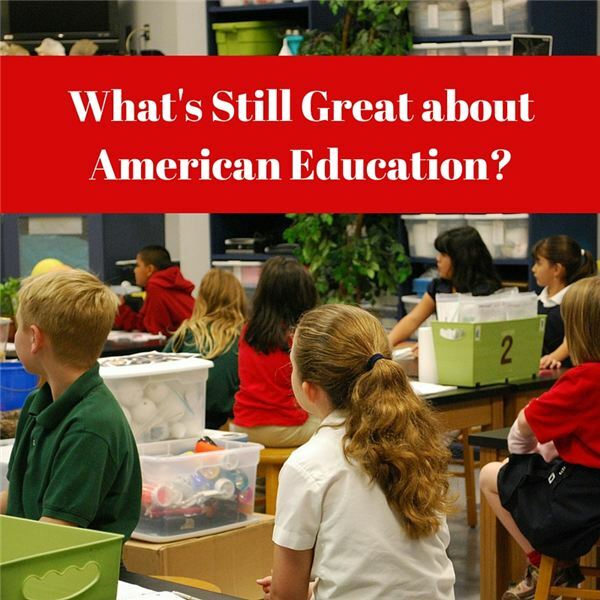 The American education system responded by raising its standards. It emphasized science and technology. The nation vowed to put the first man on the moon. We came together and we did it. We can do it again. We just need to want it. So what is our new Moon Mission? To raise a bilingual generation? To become the masters of biotechnology? To supply the cleanest energy on the planet? We have a strong, energetic tradition of education. America schools are great. They don’t need to be scrapped, just reignited.